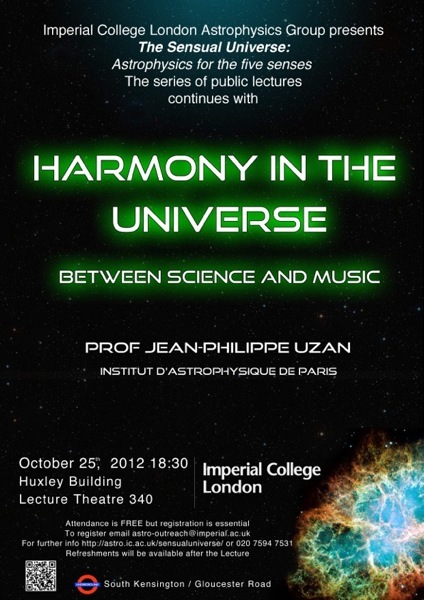 Cosmology fans in and around London: Please come here my colleague Jean–Philippe Uzan, visiting us from Paris, who will talk about “ Harmony in the Universe: between science and music” this coming Thursday, 25 October 2012 in the Huxley Building here at Imperial College. 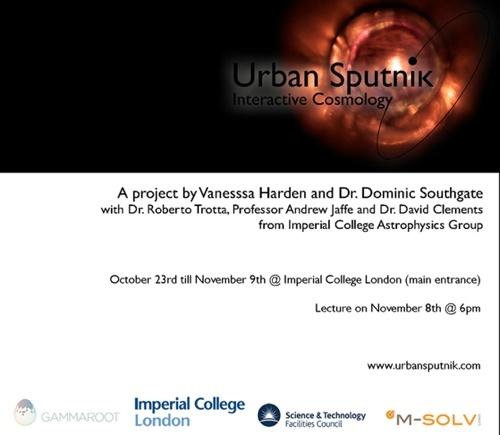 It’s free, but please contact us at astro-outreach@imperial.ac.uk if you’re going to come. 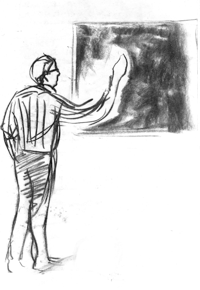 I spent a few hours last week with a bunch of science fiction writers, giving them a tutorial on modern cosmology as part of the (first) “Physics for Fiction” workshop organized by my Imperial Astrophysics Colleague Dave Clements. The participants were some very big names in modern Science Fiction, and some hot up-and-coming writers, including Stephen Baxter, Pat Cadogan, Jaine Fenn, Paul McAuley, Hannu Rajaniemi and Alastair Reynolds. There are some photos, including a couple of me in full-on lecturing mode, by photos by Simon Bradshaw on Flickr. Science fiction writers are a tough crowd: many of them are technically literate (there were a few science PhDs among them) but it’s also clear that, for their writing at least, they don’t just want to know the facts, they want to know what’s cool, and what can be relevant on a human scale, and how they can pass that along to their readers. 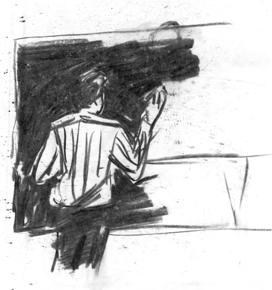 If it can be vaguely realistic, all the better. 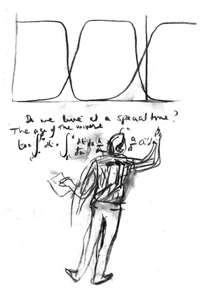 So there was perhaps more interest in planets and quantum cryptography than in the origin of the Universe (although that’s a subject that some of our participants who dabble in the grandest “space opera” could sometimes touch on. I’ve been busy the last few weeks, writing documents for the Planck SGS RR, grant proposals, getting ready for the exam season, and (I know I can’t complain), travelling to the Aegean. But this afternoon I took a few hours off and attended the Imperial College postgraduate degree ceremony. In and amongst the several hundred students received their degrees were all three of my first students (I celebrated their successful PhD vivas here, here and here). There were a couple of short speeches, and a few honorary degrees awarded (the morning ceremony gave one to F1 head and infamous labour donor Bernie Ecclestone), but most of the time was taken up by the students marching up one at a time and shaking the hand of an Imperial luminary. In addition to my students, their were a few other astrophysics PhDs awarded, including to Dr Brian May, who got (by far) the biggest cheer of the day. Me, I got the rare honor of sitting on the stage of the Royal Albert Hall, in my academic regalia (American PhDs robes are heavier than those from the UK, for reasons that escape me, not ideal for a couple of hours under stage lights — and it now appears that my hood wasn’t even the proper maroon and black combo that my Chicago degree apparently calls for). I admit I was inordinately proud of my students, in my meagre supervisory role as Doktorvater (to use the excellent Germanic term for supervisor): they’ve all done fantastic theses, important science, and most importantly by the end I was able to just get out of the way while they did the hard work. Congratulations again to each of them. If I’ve got any longtime readers, they may recall that I spent a week paired with Anne Snelgrove MP in the UK Parliament a couple of years ago, as part of a program connecting scienctists with Members of Parliament (described here and here). This week, Anne kept up her side of the bargain and visited us here at Imperial; our press office has done a better job describing it than I could do. Right now, I am in Paris, attending a meeting of the Planck Surveyor Satellite High Frequency Instrument Core Team, doing my meager bit planning for what we’ll actually do once the data starts flowing in a year or so. Also, enjoying as much French wine and food as I can manage in about 48 hours. Imperial College is to be leaving the University of London. Fantastic late-night Dinner last weekend, with (among many others!) Kosso, Rachel, Imp, Deirdre, Sophie, Barry, guest of honor Robert Scoble, and, amazingly, subsidized food and, yes, really, I'm not making this up, free champagne from Microsoft. The latter was captured by Ian, including a picture in which I look very louche indeed. I also seem to have volunteered to do a podcast with Gia for her work with the new movie, Sunshine, and finally repaid my free-wine debt to Jason and Nick from Stormhoek vineyards by explaining all of cosmology to them in about half an hour (lubricated by wine, of course). Next week, I need to account for my time down to about 15 minutes, as part of Imperial’s TOAST (The Original Academic Staff Time) Survey. This will let the College figure out exactly how we (collectively and anonymously, or so we’re told) spend our time. Which, I presume, lets them figure out how to best get money from the government, and allocate it internally. Last time, one of my colleagues included his bathroom visits, but I think they are trying to avoid such fine-grained reporting this round. Maybe I’ll post my results. Also, we’ve got a new dress code “in the light of security concerns raised by the terrorist incidents which had occurred over the Summer”: ID Cards must be visible at all times (sort of a test run for the government? ); and “Clothing that obscures an individual’s face is not allowed on any of the College’s campuses” -- no hoodies, no veils.